The area around Leicester Square, often called West End, is the entertainment heart of London. The area also includes Chinatown, Piccadilly Circus and Trafalgar Square. Chinatown is centrally located in the West End, along and around Gerrard Street off Leicester Square. It spreads into Wardour Street at one end and Newport Place at the other. London's Chinatown may not be quite as large as those in San Francisco or Vancouver but it is still a great place to dine out in the evening, authentically Chinese and definitely different from anywhere else in London. This smallish London square is the site of most British film premieres and the square itself is surrounded by terrifyingly-expensive cinemas - tickets for an evening screening will cost upwards of £17, 3D screenings will cost upwards of £15. At night, Leicester Square becomes exceptionally busy with tourists and locals, visiting the surrounding clubs and bars. In the north-west corner of the square is the Swiss Centre - unaccountably popular with tourists, the building is nowadays home to Sound nightclub, and boasts a carillion in the corner which depicts a Swiss mountain scene and plays tinny versions of Beatles hits on the hour throughout the day. The TKTS half price ticket booth is on the south side of Leicester Square for cheap tickets for theatre performances. Trafalgar Square is a large public square commemorating Lord Horatio Nelson's victory against Napoleon's navy at the Battle of Trafalgar in 1805. The central monument within the square is a single tall column on which the figure of Nelson stands gazing over London and is one of the great iconic images of London. His monument is surrounded by four colossal lions and a series of large fountains. Much more than just an open plaza, Trafalgar Square is famous as the location of a large number of important buildings and institutions that surround the square and fill the streets surrounding it. Trafalgar Square also marks the northern end of Whitehall, the centre of British government. 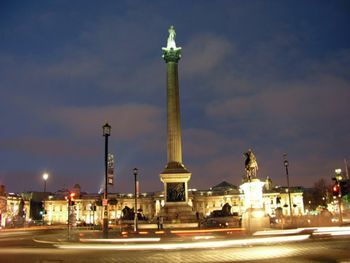 In 2003 Trafalgar Square was renovated and expanded to link up directly with the National Gallery on the north side of the square - a great improvement to the traffic which once completely encircled this, the largest public square in the West End. The early 18th century church of St Martin-in-the-Fields stands at the north-east corner of the square and hosts frequent and popular classical music concerts. Just by the church, Charing Cross Road gives access to the fabulous National Portrait Gallery, and leads on further to Leicester Square, Soho and the famous collection of bookstores on the road itself. To the south, Whitehall leads to Westminster Abbey, the Houses of Parliament and 10 Downing Street. Christmas time sees the erection of a large Christmas Tree within the square, the annual gift of the people of Oslo, capital of Norway, as a token of gratitude for Britain's help in WWII. 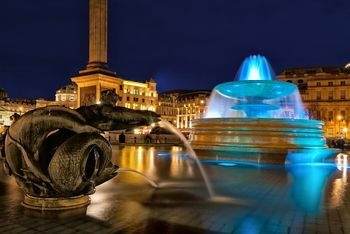 Trafalgar Square is also traditionally the scene of lively celebrations for Londoners on New Years Eve, though an increasingly heavy police presence has meant that some antics (drunks leaping into the fountains) have all but disappeared. More recently, Trafalgar Square has served as an outdoor venue for concerts and VIP appearances, courtesy of the Mayor of London's Office, which is keen to see Londoners use their public spaces better. Visitors to the square on an ordinary day may also discover small-scale demonstrations and public speakers - the Square is a convenient gathering place near to, but not threatening, the seat of British Government down the road at Westminster. 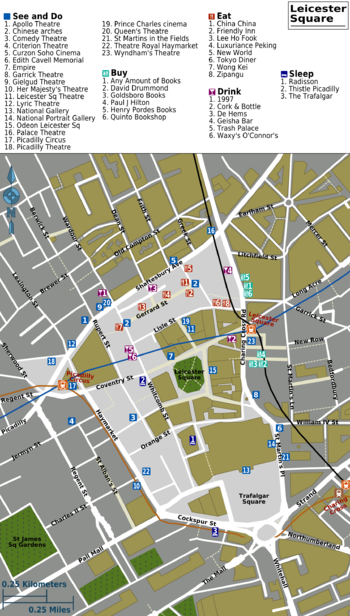 Leicester Square is served by a tube station of the same name actually located just off the north east corner of the Square on Charing Cross Road. The station is on both the Northern and Piccadilly Lines and acts as a convenient place to start any exploration of London's West End. Chinatown is a short walk from both Piccadilly Circus (Piccadilly and Bakerloo Lines) — walk east along Shaftesbury Avenue, before turning right at Wardour Street, watch for the ornamental gates — and Leicester Square (Piccadilly and Northern Lines) stations. The nearest tube station to Trafalgar Square is Charing Cross on the Northern and Bakerloo Lines. Piccadilly Circus is served by a tube station of the same name. Charing Cross mainline station serves the south-eastern region of England. Walk. This is a small district which lends itself perfectly to exploration on foot. Leicester Square square hosts most high-profile London cinema premieres, on which occasions it is fenced and crowded beyond comfort by people desperately trying to take a look at their celebrity of choice. Please note that most of the booking office numbers given below will only work from within the UK. If you want to make a booking from overseas, use the relevant website. The Leicester Square Box Office, otherwise known as LSBO also offers a great selection of great deals on tickets to top London shows and musicals. Tickets can be booked  over the phone on +44 20 7087 2999, or in person! Charing Cross Road and the tiny Cecil Court which leads off it, have long been the centre of the specialist and antiquarian book trade in London. There are fewer outlets than previously as spiralling rents pushed out a lot of the traditional booksmiths but a lot still remain. Any booklover will be in heaven here. All sorts of food are available. While London's Chinatown boasts some of the city's best Chinese food, quality and value vary enormously between individual restaurants. While some consistently win awards, others seem to be regularly being refurbished following visits from the local Environmental Health department. Unless you're on an extreme budget, it is worth paying a little more for quality food and service. Be careful especially with the common all you can eat deals. Leong's Legend and Leong's Legend Continued... serves Taiwanese fare. Chilli crab and omlette dishes are specialities. So popular they opened a second resturant which is arguably more busier. Those with a craving for Taiwanese pearl tea, should head over to Bubbleology at 49 Rupert St, Soho. CNR Cafe tucked down an alley off Whitcomb St, is worth checking out for cheap Malasyian-Singoporean eats. There are several buffets in Chinatown, of which the cheapest is Mr Wu at £4.95, its and cheerful, and you get exactly what you pay for. Some of them have a larger selection of dishes, but quality varies and can be a lot to be desired. If you do mind, Hong Kong Buffet is the most expensive at £12, but is more tasty. O'Neil's, Irish chain bar lost in the heart of Chinatown. 3-levels with a houseband on busier nights, who always seem to play the same U2 and Kings of Leon songs. Very few visitors actually stay in this district and the options which are available are not particularly good value. This is a district to visit, not to stay in. This page was last edited on 20 March 2018, at 08:50.